The Splash Brothers had the worst joint shooting game of their playoff careers, but the Warriors had no problem downing the Cavaliers 104-89 in Game 1 of the NBA Finals. Even in the worst joint shooting game of their playoff careers, Stephen Curry and Klay Thompson made essential contributions to Golden State’s 104-89 Game 1 victory over Cleveland. Cavalier defenders crowded them wherever they went, careful to play up and into their space as much as each matchup allowed. Additional defenders jumped into frame when possible to trap Curry against the sideline or pick up Thompson when he doubled back. With that strategy, the Cavs managed to hound Curry and Thompson into 8-for-27 shooting (4-for-13 from three) and just 20 total points. 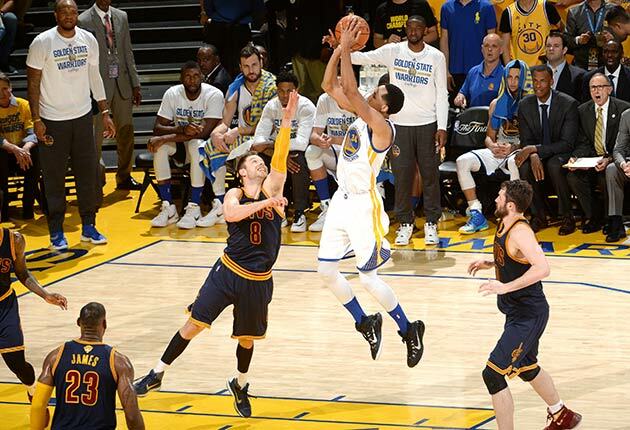 In doing so, however, Cleveland made compromises all over the floor that yielded wide open layups and uncontested jumpers to a variety of Golden State’s role players. Even plays that neither Curry nor Thompson were directly involved in seemed to end in some Cavalier or another losing track of their assignment completely. It was as if Cleveland retained the big-picture concept of how it aimed to defend Golden State’s top two scorers but lost all the precious detail that goes into making such a strategy tenable. Six of the “other” Warriors finished the game in double-digits, led by Shaun Livingston’s career-high 20 points in 27 minutes. So severe were Cleveland’s defensive failures that LeBron James was switched over to defend Livingston during a particularly prolific stretch. His doing so didn’t stop the bleeding. Golden State pulled away by dropping a cool 30 points in the fourth quarter alone, just six of which came from Curry and Thompson. That won’t do for a road playoff game against the Warriors. One might look at the shots Curry missed or Thompson passed up and assume a sort of defensive blueprint. To the extent there is one, it seems quite faulty; Cleveland only managed to contain Curry and Thompson by selling out many of their corresponding responsibilities, producing a superficial sort of success. There’s no good in checking the reigning MVP if doing so leaves the rest of the defense exposed in the process. Cleveland will have to strike a better balance, and quickly. Every passing game gives Curry, Thompson, and the Warriors coaching staff more time to trigger mistakes in the Cavs’ defense and find easier workarounds. Time is simply on Golden State’s side—as is so much else.